George Hillyard Swinstead RBA RI (1860-1926) - painter in oil and watercolour of genre, portraits and landscapes. Fourth son of the landscape painter Charles Swinstead, and brother of the artists Alfred Hillyard Swinstead and Frank Hillyard Swinstead. He was meant for a commercial career, but early on persuaded his father (himself a painter and art teacher) to let him pursue art too. He studied art at the RA Schools in 1881. Swinstead exhibited at the Royal Academy from 1882 and elected R.I. in 1907. Success came with his Academy picture of 1885, The First Step, a picture of a young girl with a dog on a rustic paved stairway, admiring a puppy trying to climb the first step. Many similar works followed, along with portraits. Closely allied to his feminine portraits, are some idealised portraits of long haired girls with flowers, again rather good. After painting portraits and genre for many years he turned increasingly to landscapes and coastal scenes. 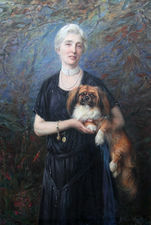 Swinstead also produced some Eastern works, following a 3-month stint in Egypt, some cricket pictures - he was himself a cricketer - and portraits of dogs, considered among his best works. In his later career, he concentrated on studies of coastal scenery. He lived in Hampstead, north London.